A big thank you to Clive for this great overview of the Baroque guitar, previously published on Classical Guitar Canada. Make sure to visit his website to see more of his work and recordings. 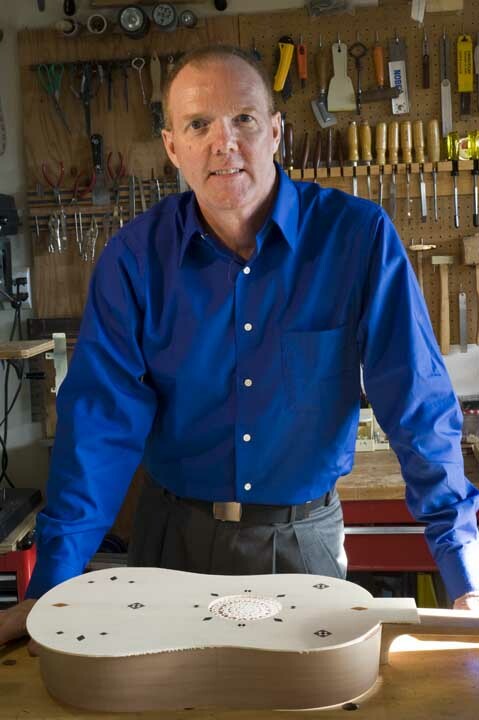 All photos of guitars are by Clive Titmuss that he built himself. If you look in any anthology of music for the guitar from the seventeenth and eighteenth centuries, you will usually find that much of the music is for keyboard or lute. Guitarists love to play the music of Bach, Scarlatti, Handel, Rameau, Weiss and others—none of whom actually wrote guitar music. Other than a few frequently played pieces by De Visee, Corbetta and Sanz, the vast repertoire of the baroque guitar is undiscovered territory for most players. The reasons, aside from a difference of tuning (more on this below), is that the modern guitar has quite different musical properties. The modern guitar is a baritone/tenor, but the baroque guitar is an alto instrument, about the body size of a viola. The rich tenor register of the guitar, which gives it so much of its distinct character, is not so evident on the baroque guitar. The strumming and ornamental effects that are common on the early instrument don’t make much sense on the modern one. A full-guitar strum is emphatic and powerful, whereas on the baroque instrument, it is lighter and more percussive. The sustaining qualities of the modern guitar are a bit too much for the thin-textured and ornamented music, clouding the articulation of the rhythm. Campanelas, the playing of successive scale tones on separate strings, easily rendered by re-entrant tuning, is a prominent feature of the music of Spanish and Italian composers of the late 17th Century. 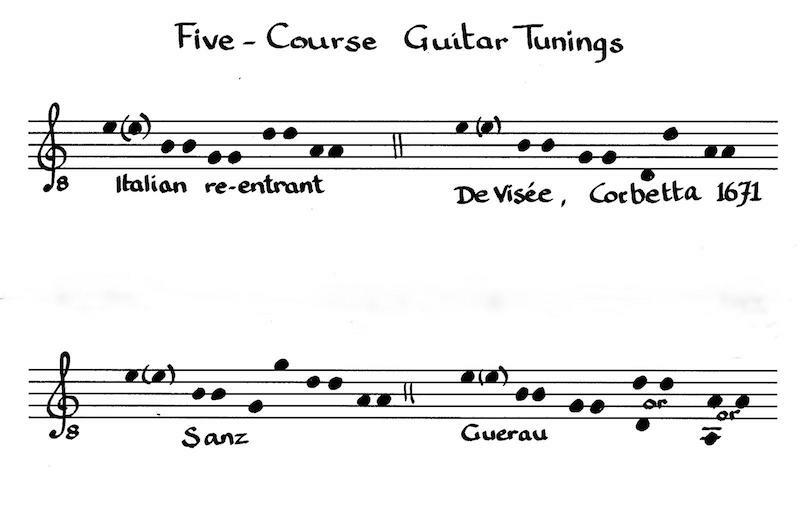 Re-entrant tuning strings the instrument with the two lowest courses an octave higher than the current tuning. The double stringing of the pre-Classical era allows for a number of possibilities of the mounting of lower and higher strings. The practical Italians quickly caught on to the advantages of the tuning: the guitar may be strung with only three sizes of string. The classical instrument is only able to suggest campanelas, and other re-entrant effects, found in profusion for a century of the guitar’s history. 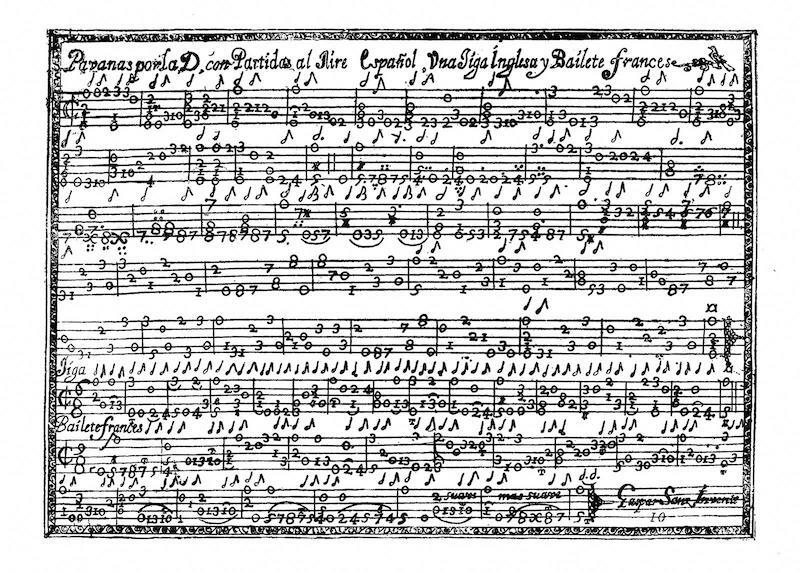 Much of the 17th Century repertoire is based on stylized dances, which without vocal influence, can be abstract in their content. The most frequently played part of this literature, its popular hits, consists of artfully-set folk music. The greatest music for baroque guitar is difficult to render adequately on the modern guitar because the traditions of the two instruments have diverged so widely: They speak basically the same language, but with a different vocabulary and accent. Help is at hand: herewith a guide to what you need to play and understand the marvellous music of the five-course baroque guitar. 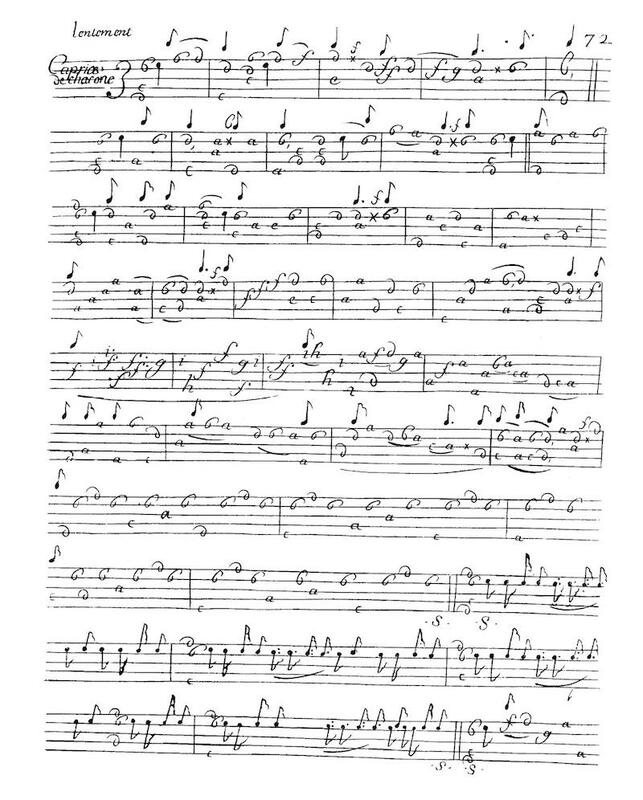 There is a small printed literature for the late Renaissance four-course guitar, but the earliest printed music for the five-course baroque guitar stems from around 1600, when the instrument was popular mainly in southern Europe. The intent of the first printed works was mainly pedagogical. 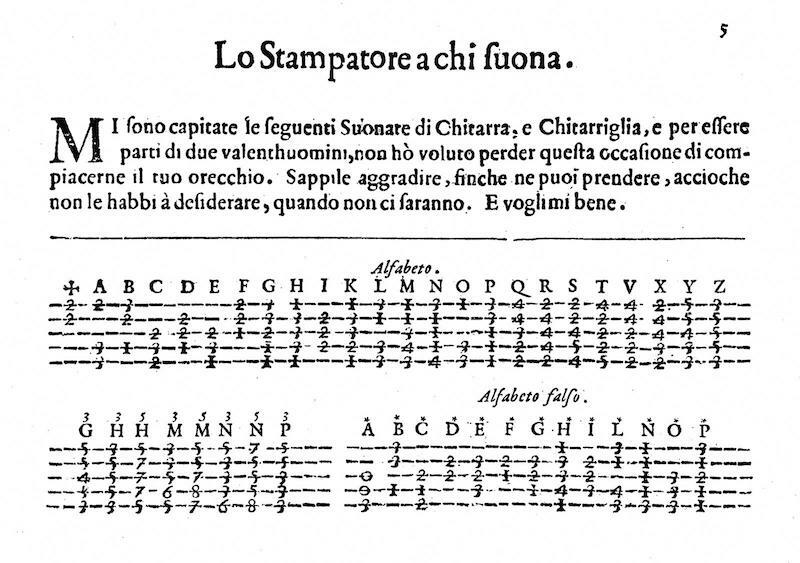 Rather than providing composed art music, these early books taught the Italian alphabet, a simple notation that assigns letters (not the note-name) to stereotyped chord formations. In this way, it was possible to notate and print easy pieces such as Folias, Españoletas, Ciaconas, and other chord formulas simply by using a capital letter and a stroke above or below the line to indicate up or down strums. Few subdivisions were used and the rhythm was often rudimentary, intended to be supplemented by the player’s ear. When it comes to amateurs and the guitar, it has always been and still is “learn four chords and join a band”. Most of the eighteenth century composers whose work is mainly known in the nineteenth century, such as Sor, Aguado, Giuliani, Carcassi and many others, were trained in Italian pedagogical traditions in the 18th Century, and would have learned this alphabet as students. The chord forms underlie their music in a fundamental and organic way. Every student of the guitar should know a little of the alphabet, because it provides a window into the deep structure of the guitar’s language. Here is Carlo Calvi’s alphabet page and a few simple pieces. It is amazing how well this simple system works and it is the door into a world of baroque guitar masterpieces. This music was often played without a pick, using only the index finger up (for weak beats) and down (for strong), and this alphabeto technique was still in use two centuries later. Most music is still played on the guitar with this basic style unchanged. If you look over this list, a few things immediately stand out. Though we think of the guitar as a quintessentially Spanish instrument, it appears that Italy drove the development of the music and its publication. Francesco Corbetta’s three books of Italian tablature: published in Bologna, Milano and Brussels put the guitar in a Spanish context, using “Spagnola or Spagnuola” in the title, as do the books of Foscarini, Pellegrini, Bottazari and others. The earliest publications employ the abecedario Italian or Italian chord alphabet, without the use of tablature. Aside from a strong political connection between Spain (Castille, Catalonia) and Italy (The Duchy of Milan), there are social and economic reasons for this. Italy’s large trading and merchant class favoured the guitar for familiar reasons: it was portable, inexpensive to purchase and string, easy to master at an amateur level, and it presented an ideal vector for the accompaniment of popular vocal and dance music. The repertoire found in the earliest publications is mostly rooted in this tradition. Later, when the guitar became more fashionable, Italian makers began to decorate its flat plates, and neck with veneer, marquetry, parquetry and inlay, creating a desirable object for wealthy collectors that was more easily played than the lute. Without the complications of the lute, the guitar quickly rose to supplant it in most of Italy during the early part of the 1600’s. Later books, especially those of Foscarini, Corbetta, Bottazari, Granata and Roncalli, increasingly dispensed with the chord alphabet style and began to incorporate the “brisé” style of the lute and its stylized dances: the allemanda, corrente, and sarabanda. Later the roles reversed and the lute began to ape the strummed style of the guitar, in compositions by Gallot and Mouton. These middle period books began to develop an instrumental idiom which took advantage of the tuning, with slurred and arpeggiated passages, chordal progressions with suspensions and dissonances and specific ornamentation, especially at the cadences. Corbetta’s career tracks the development of the books and the music in the middle generations of the 17th Century. 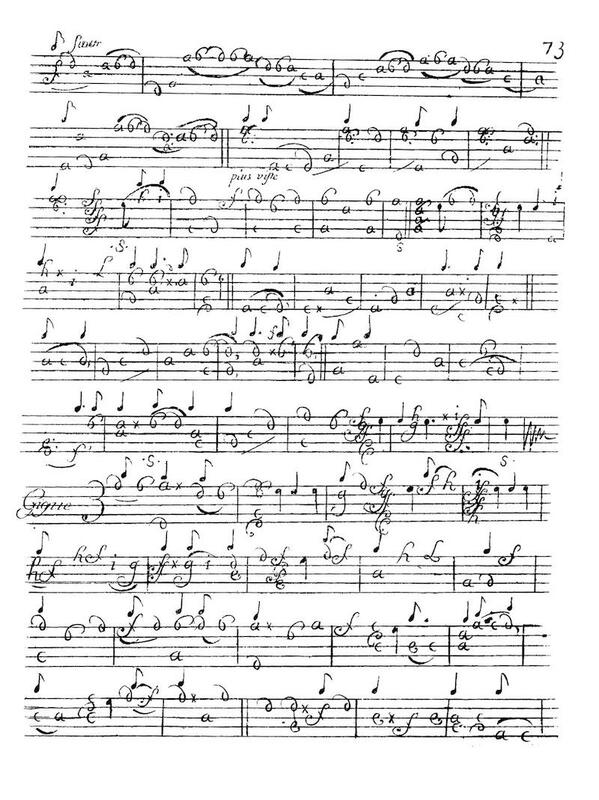 His 1643 Milan book, Varii Capricii per la Ghittara Spagnuola, begins with a Toccata; then there are sixteen two-page Passachali, each on concluding with a modulation to the key of the next; then three suites composed of three dances; a two-page set of Follia variations; five pages of figured bass accompaniment intabulations which show the rules of chord progression realized on the guitar; the book concludes with two elaborated Sinfonias with continuo bass lines showing application of Corbetta’s guidelines. The book places its emphasis on the Passacaglia, then a few suites, followed by instructional treatise. This plan is echoed by many Iberian and Italian books, including those of Sanz, Guerau, Pellegrini, and Foscarini. Almost every early book begins with the alphabet chart. 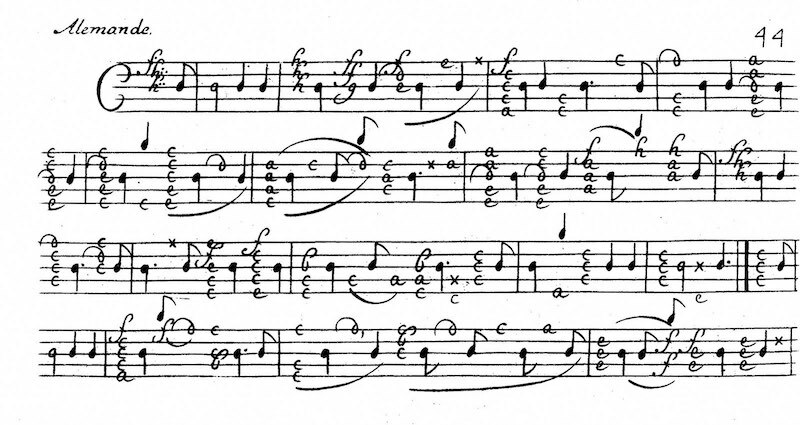 The passacaglia, and its cousin the ciacona is not a melodic, but a harmonic formula, and it provided guitar composers with an opportunity to orchestrate simple dance structures. 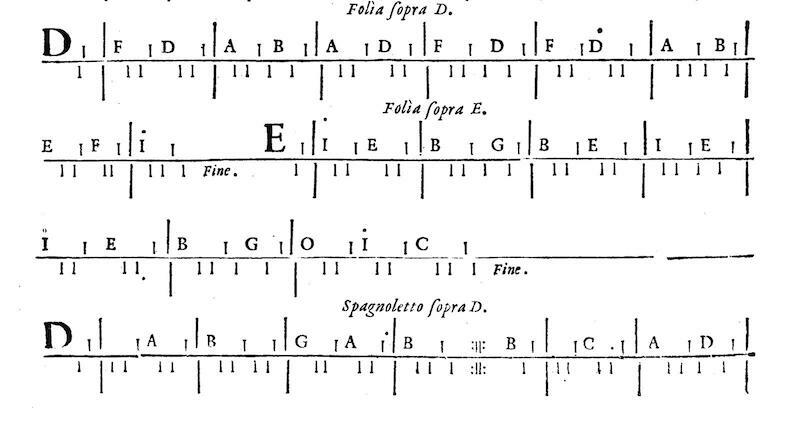 Corbetta, Sanz, De Visée and others frequently added falsas, or deliberate wrong notes (unprepared suspensions, acciacature) to their chords, so much so that an entire sub-set of the alphabet was created, the alfabeto falso (see Calvi’s table) which adds seconds, sevenths and even sixths to the chords. Usually these falsas are simply open strings allowed to sound in more conventional positions to add harmonic flavour. This willingness to experiment with dissonance is a inherent to the guitar’s early history, and that legacy is readily apparent in most contemporary Latin guitar music. Gradually, the composers shifted from variation forms based on Italian chordal dance harmony to two-section dances with a more developed instrumental style with influences from violin and keyboard music. There was a slow move away from the strummed style of the alphabeto, adopting a more full-voiced approach that exploited the ease of notation and printing afforded by tablature. 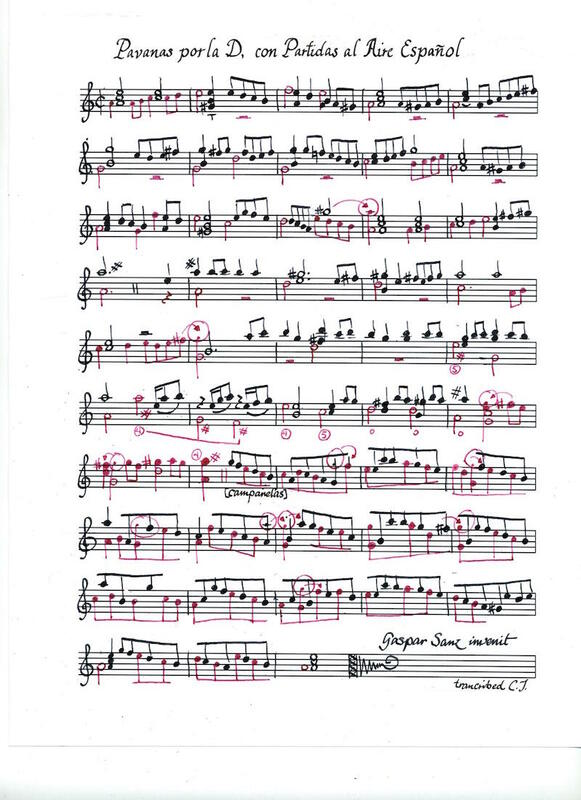 In print and manuscript notation, tablature overcomes the problems of re-entrant and experimental tunings. Like the lute, there were experiments with altered tunings (scordatura), especially by Bottazari, Corbetta, De Visée and Campion, but unlike the French lute practice of the middle 1600’s, these tunings never replaced the basic one. 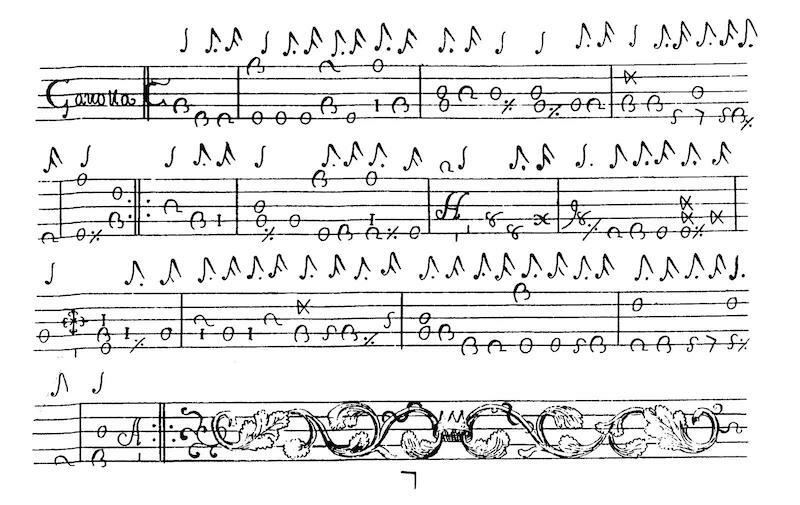 In moving away from the Italian chordal dance style, Corbetta set the example once again with his two French tablature books of 1670 and 1674. They are composed almost entirely of suites or suite movements: the 1670 book La Guitarre Royalle, is mainly in the brisé lute style, while the 1674 book, also called La Guitarre Royalle, returns to a rococo strummed (batterie) style. In the books of his Iberian contemporaries, Sanz and Guerau, the passacaglia still dominates, with variation on the Folias, J’acaras, Espanoleta and other simple tunes given similar compositional treatment. The style of Sanz is connected to popular music, while Guerau, a church composer, concentrates on contrapuntal variations. Both composers advocated the plucked (punteado) style. The baroque guitar style as a whole never abandoned the strumming attack which gives the music much of its character. The constant vacillation of strummed and plucked is one of the principal charms of hearing the music played on a period guitar. Instruccion de Musica Sobre la Guitarra Española y Metodo de sus Primeros Rudimentos, hasta taner la con destreza. Con dos Laberintos Ingeniosos, Variedad de Sones, y Danças de Rasgueado, y Punteado, al estilo Español, Italiano, Francès, y Ihglès. Con un breve tratado para acompañar, con perfection sobre la parte muy essencial para la Guitarra, Arpa, y Organo, resumido en doze reglas, y exemplos los mas principales de contrapunto, y composcion. Following the model established by the Italian guitar books, Sanz greatly expanded the pedagogical elements of his work, setting a precedent for successful self-instructional volumes by Aguado, Carcassi, Carulli and others. Sanz gave a complete account of the still-viable alfabeto chord system, apparently believing in its value as an instructional aid. Many of the germinal alfabeto formulas—Gallardo, Españoleta, Folias, Jacaras, Paradetas, later appear in his work as fully composed variations in Italian tablature without alphabeto. This is a departure from the Italian practice of Roncalli, a contemporary, who continued to use the alphabeto in combination with the tablature. Sanz’ examples for figured-bass accompaniment, which gives the “rule of the octave”, form a valuable guide for modern players in the use of the guitar for continuo. Since interest in early fretted instruments has increased in the last thirty years, there has been a lot of discussion about the tuning of the baroque guitar. For the realization of the music of some composers, this feature of the instrument is of great importance, and Sanz is one of these. 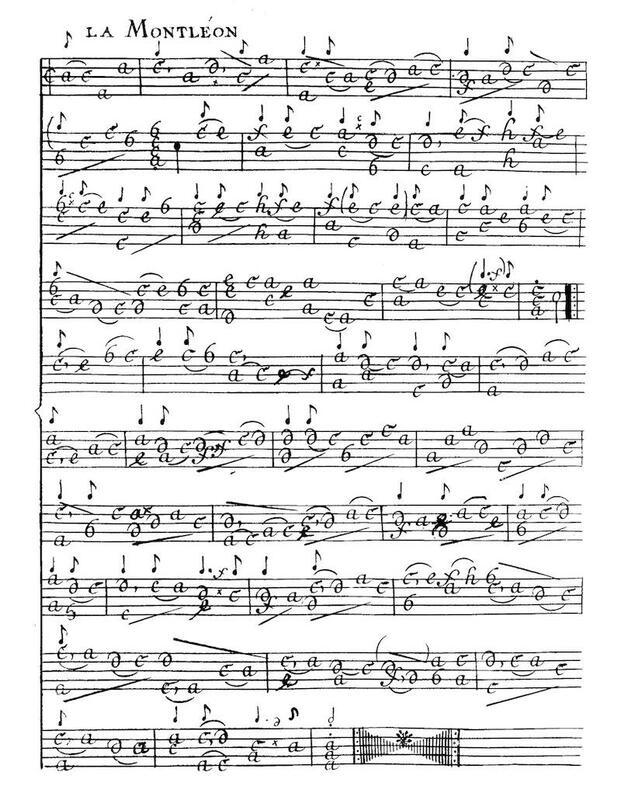 Sanz’ music is heavily salted with campanelas, but instead of distributing it throughout his pieces, he is fond of creating entire passages and variations of the passacalle with it. He derides bourdones, the practice of putting one or both of the fourth and fifth courses into a lower octave, as suitable only for “noisy music”, by which we may infer “dance music” played in ensemble rather than the solo music. His contemporary Guerau makes no apparent use of campanelas. Most modern guitar transcriptions eliminate the final section of Pavanas. Modern editors avoid the campanelas passages in his other pieces, and thus Sanz’ most inventive idiomatic writing is not known. A widely available facsimile edition, published in Spain in recent years, makes a complete hash of the transcription of Sanz’ music examples and the chord alphabet, as if Sanz played an instrument in modern tuning. Sanz is at his best when setting his native music in Spanish style. Jacaras, the Canarios settings, Marizapalos—Gallardas is one of his best pieces. His Passacalles are less successful, and his occasional forays into international waters—Allemanda, La Serenissima and La Preciosa suffer from an academic quality and not being as freely melodic as his other pieces. They are also the only works in this book to use the mixed Italian style (alphabeto and tablature) of the second half of the 1600’s. But because of the vitality of his music, it is no wonder that he is among the most frequently played of baroque guitar composers. Francisco Guerau is certainly one of the most important guitarist/composers of any period. He was apparently a theologian, violinist and choral composer in the household retinue of Charles II of Spain. His book, Poema Harmonico (1694) is a monument and in many ways, the valedictory work of a tradition which began with the vihuela. Unlike most guitar books of the period, Poema Harmonico expresses the outlook of an entire philosophy, a Jesuitical meditation in music, expressed as a series of variations, ascending in the cycle of the hexachord. Guerau’s book, dedicated to Charles II, Hapsburg monarch of Spain, was “…composed by someone who has been in your Royal service for thirty-five years”. He also served the church, as a composer of contrapuntal music for voices, and this skill is much in evidence in his Passacalles. 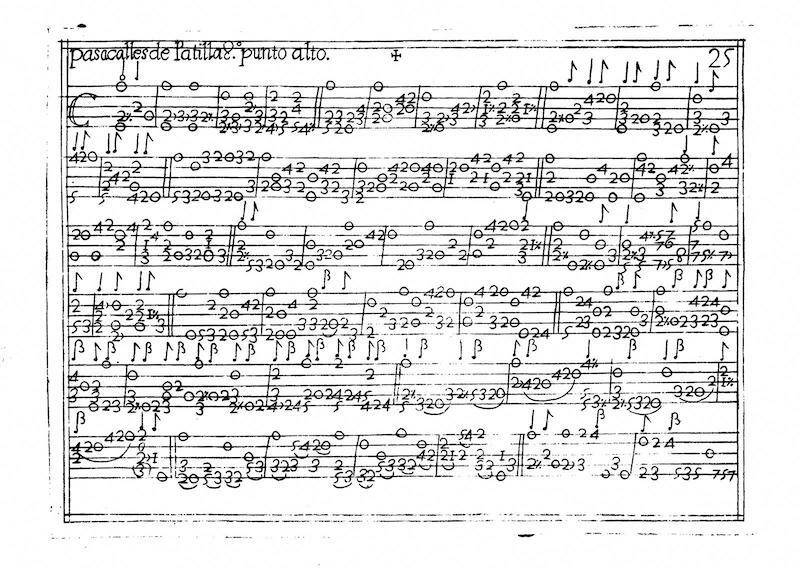 In arranging his book according to the hexachord, Guerau participates in a syntopical tradition going back to Corbetta’s first book of 1639, Sanz’ Laberinto (Labyrinth, an alphabeto-style passacalle which modulates continuously through the keys). Franz Hinterleithner, a Viennese lutenist and composer of the late 17th Century, also wrote a long prelude which modulates through all the keys. Eventually this trail leads to Biber’s cycle of Rosary Sonatas for the violin and J. S. Bach’s Das Wohltemprirte Clavier (Book I 1722, Book II 1744), 24 Preludes and Fugues, one for each key, major and minor. His material forms are much the same as Sanz—principally the Passacalle, which forms the bulk of his work, but at the end he indulges his audience in variations on the Xacaras (sic), Mari-Zapalos, Españoleta, Pavana Gallarda, Folias, Marionas (ciacona), Canario, and Villano. His variations on these 17th Century standards extend to many more variations than Sanz. The Xacaras, for example, has 39 variations. Each of the Passacalles has a series of variations in Tempus Imperfectum, 4 beats, then a series in Tempus Perfectum, or three beats. This practice of adding a triple dance dates to the middle of the 1500’s, even earlier to the bassadanza of the previous century. It was common to conclude each duple dance with an up-tempo triple dance with the same bass line and melodic contour. For Guerau, it represents a metaphorical absolution. Guerau’s tuning is obscure; he does not mention it, as many other books (Sanz, De Visée, Corbetta) do, and his music contains no obvious campanelas passages. It is difficult to determine how he wishes the guitar to be tuned—with or without bourdones (strings in the lower octave, added to the fourth and fifth courses, which produce a more bass-oriented sound). Having tried three possibilities, the conventional Italian tuning, the French tuning of Corbetta/De Visée, and the tuning with both bourdones, I can’t really say that Guerau sounds better with any one over the other. With the conventional re-entrant Italian tuning, many of his imitative passages sound like bicinium, a time-honoured duo of two equal voices in counterpoint, a standard feature of the choral music of the church. With bourdones, at least with the historical gut strings, his music does not really sound much different, since he rarely uses the guitar as a purely chordal instrument. Guerau is unique in that he is one composer whose music sounds wonderful on a modern guitar in normal tuning, straight from the tablature. I discussed Corbetta as a prototype that runs through the 17th Century, mainly because he is international in his style, worked in Italy, published in Brussels and ended up in France. He influenced other composers and set the fashion for the guitar as it passed from the hands of itinerants, to the merchant class, and finally, at the outset of the 18th Century, to the courts of the Kings of France and England. Corbetta’s personality as a performer and composer was crucial in advancing his career. His early compositions are typical of his period, delicately inspired, and even gripping. The passachali of the 1639 book are certainly some of the finest works written for the instrument. The early suites are melodically inventive, the use of sequences and imitations draw a fine web of narrative over a thin frame. Other than the occasional chord, all of the music is subtly evocative, sometimes composed only with single tones in succession. One of the most attractive suites alters the tuning to a chord in B flat. There is little theatricality or the overwrought academic rectitude that we find in Foscarini, a contemporary. The two French books, both titled La Guitarre Royalle, are markedly different in style. 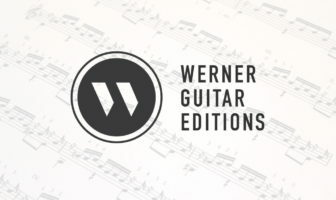 The first book is more luthée, with arpeggiated movement and refined counterpoint of melody and bass in the style of de Visée; the second book makes use of batteries or strumming style, with contreparthies, or second parts written to accompany the solo guitar. The first book is music intended for listening, while the second seems more to be directed at the accomplished amateur player. Corbetta cunningly uses more added sixth chords and seventh chords, which require fewer fingers to execute. One of his most remarkable pieces is the from the earlier book is Caprice de Chacone, variations on a four-bar formula which employs the full gamut of his variation technique: campanelas, falsas, luthée, cheutes (slurred passages) and repico, a complex blizzard of strumming using thumb and fingers. The cultivated guitar style of Robert De Visée is virtually indistinguishable from his lute and theorbo music, except for the absence of low bass lines. Like his lute contemporaries, Mouton and Gaultier, he occasionally incorporated the rondeau form of the chaconne and passacaille into his other dance forms. Some of his pieces (La Muzette, et al.) have concordances for all three instruments. In most cases it is impossible to tell which were composed first, and arranged later. He also made arrangements of pieces by Lully (Les Harlequins, an opera-ballet intermezzo, Ouverture de la Grotte de Versailles) and Couperin (Les Sylvains, a piece for harpsichord) for guitar/theorbo/lute. His compositional style is from a later generation than Corbetta, and though he came from Spain, he adopted and executed the idiom of late French 17th Century music with complete fluency. His two books for the guitar are composed in the mould of Jean-Baptiste Lully, the supervisor of the Sun King’s music, the composer of ballet and operas which were expressly intended for his court’s enjoyment at Versailles. In both of his guitar books, he presented several of the suites in two-clef arrangement with figured bass for use with a melodic instrument or the harpsichord. These arrangements make excellent material for the guitarist (and violin, flute or oboe player) to explore improvisation of a figured-bass accompaniment. De Visée thus makes clear his method: the composition of a two-voice framework with the addition of details idiomatic to the lute, guitar or theorbo. This property makes his work distinct from the work of most of the other guitar composers, who are more often followers of their fingers. His carefully structured melodies are articulated by skilled harmonization, creative use of diminished chords and refined ornamentation. Vaudry de Saizenay, Louis XIV’s naval intendant, collected and copied De Visée’s theorbo and lute music, along with the music of other important composers, in a large manuscript, showing how he penetrated to the highest levels of the French court. The second of his exquisitely engraved guitar books, Livre de Pièces pour la Guittare (1686) shows how he modified his earlier style, simplifying the technique and making the melodies more trenchant, perhaps following the lead of Corbetta. At the end of his career he collected and printed a volume entitled Pièces de Theorbe et de Luth, which despite its title, presented arrangements of his most famous pieces in the two-clef figured bass format he used in his guitar books. In the foreword, he complained that “nobody reads the tablature anymore”. It was the epitaph of the baroque guitar. The guitar’s shape, size, stringing and decoration altered dramatically during the course of the 17th and early 18th Centuries. The beautifully proportioned Choco guitar is barely larger than a tenor ukulele, with a simple barring scheme and very light construction, dating from about 1600. It may have begun life as a four-course guitar, later altered. Venetian guitars in Italy, such as those made by Sellas, often have vaulted backs in imitation of the lute, and are elaborately ornamented, one reason for their preservation. During the later 1700’s the Voboam family, kept the slender shape and flat backs, but elongated the neck and incorporated more elaborated barring, and the use of exotic materials, such as rosewood, ebony, ivory and snakewood. (My copy, seen here, uses ivory reclaimed from piano keys.) These instruments are surprisingly resonant and rewarding to play. At the end of the 1700’s, Spanish makers began to experiment with simple fan barring schemes, making their instruments deeper and with larger bodies. This anonymous instrument (my copy seen here) used figures of the family escutcheon, lions, birds and plants inlayed into the top. This direction toward larger guitars, once established in Madrid and Cadiz, continued until the five-course instruments were replaced by six-course guitars around 1750. Another type of guitar, the chitarra battente, borrowed the violin’s tailpiece and cranked-up bridge, adding metal strings and later, metal frets. These guitars were played outdoors with a pick and alfabeto-style, and were not really intended for solo music. You are an informed reader who is curious about the baroque guitar, its technique and music, the long history. You are interested in the way in which its culture leads to the classical instrument of the early 19th Century and underpins the vast wealth of music for the modern instrument. The chief problem with modern transcriptions is the missing details, and the way in which editors fill chords, eliminate ornaments, strumming effects and dissonances, in general dealing badly with the re-entrant tuning and its idioms. How can you get closer to this tradition without getting a baroque guitar? Easy! If you have a beater guitar, or a second instrument available, you’re set. Remove the fourth, fifth and sixth strings. Take a b string and put it where the fifth string was, and an e string and put it where the fourth string was. Tune these strings to d’ and a, an octave above where they were, or unison with the third fret of the b string and second fret of the g string. Now you have the Italian re-entrant tuning, and the baroque guitar literature lies at your command. Using only the facsimiles I have provided here, you may easily proceed to learning some music from the original prints. Try learning the Italian alphabet chord system from Calvi’s chart (above, also reprinted in Sanz, Pellegrini, or Corbetta’s 1639 book.) This also, is easy, play the chord, say the letter. Try a few simple pieces—Folias, Españoleta, etc., most of these are familiar to every student. Strum the chords with your index finger. Keep a copied chord chart on your music desk until you know the most important ones. Most pieces need only four or five letters of the alphabet. Then try some more challenging material, Corbetta, Sanz, Foscarini, Roncalli. To play De Visée from the original is even easier, just replace your d string. An excellent correctly transcribed modern edition of this composer’s complete guitar works is available, edited by Robert Strizich. The music is more challenging to read from pitch notation, but it allows the player to make her own decisions. Once you have become more familiar with the baroque guitar idiom, I challenge you to learn to improvise a figured bass accompaniment, covered in the principal sources, and to learn to improvise ornamentation and passages in their style. This too, is just a matter of applying what you have read, heard, and learned from the composers’ books. Translations of forewords and other pedagogical material from these books are available on the web. Facsimiles are available very reasonably from OMI (http://www.omifacsimiles.com/index), Saul B. Groen (http://www.saulbgroen.nl/) and other suppliers. Almost all of the important Italian, French and Spanish baroque guitar books are in print in facsimile editions. The Early Guitar, a handbook by James Tyler (1980) is a fine introduction and survey of the instrument and its music. A more recent survey, The Guitar and Its Music: From the Renaissance to the Classical Era (Oxford University Press, 2007) by James Tyler & Paul Sparks is larger is scope and covers recent discoveries and reliable modern editions.